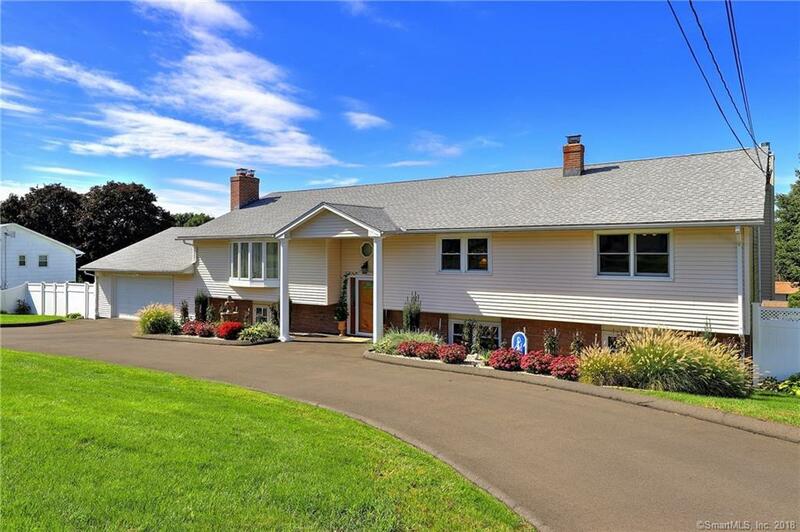 Remarkable, expansive home in convenient and sought-after North Haven location! Hardwood floors throughout main level (except bathrooms and sunroom). Massive formal living room with granite fireplace, bay window. Formal Dining room with sliders to large three season sunroom. Newly remodeled eat-in-kitchen, with quartz counter tops and stainless steel appliances! Generous master bedroom suite and sitting room with propane fireplace, master bath and private laundry! Three additional bedrooms and full bath. Hardwood floors in main living spaces and bedrooms! Enormous family room with fireplace, new carpet and built-in wet bar! Second newly remodeled kitchen, newly remodeled full bath, bedroom, living room with built-ins with separate entrance in lower level. Approved inlaw! Freshly painted throughout! Whole House Generator! Central Vac! New 2014 - propane heating system, new central air, updated electrical, tankless water heater, roof, driveway! New flooring and carpet in lower level and inlaw! NOTHING TO DO BUT MOVE INTO this lovely, spacious home! Convenient to Yale, Quinnipiac, Southern, major commuting routes, shopping and restaurants! Preapproved buyers only please! Directions: Ridge Road To Marion Drive, Left Onto Marion Court.